No longer will there be inaction. To die a martyr’s death and to be crucified upside down was his last wish. He felt unworthy to die on the cross, the same way our Lord did die. But he understood, he would spend eternity with his Lord and Master. He changed lives, he healed the sick. This sacred mission was his burning passion. He was the solid rock on which the Church of Christ was built. 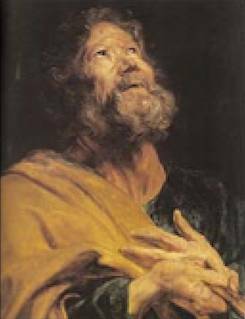 Anthony Van Dyke (Flemish painter,1599-1641) Penitent Apostle Peter (1617-1618), Oil on canvas, Hermitage, St Petersburg, Russia.